Don Leo McConkie was born August 23, 1903 in Vernal, Utah. His parents were John Luther McConkie and Eliza Holyoak McConkie. Don's father, John, had been born in Kansas in 1873 to George Wilson McConkie and Susan Ann Smith McConkie. John was only one year old when his family moved to Utah. The McConkie family lived in Utah for twelve years, then decided to move to Old Mexico. Two years later, when George W. McConkie died, the family moved back to Utah and settled in Vernal, where they bought a home in the small town of Maeser. John McConkie went to work in Moab in Southern Utah to earn money to pay for the home, and it was there that he met Eliza Holyoak. They were married in the Salt Lake Temple in April of 1894. John and Eliza had eight children, including Don L. McConkie. Don's father was state road agent for eight years, and served on the school board for many years. John was also president of the Maeser town board for a number of years. He served as a counselor under three bishops, and was a high councilman. He served on local stake missions, and also as a full-time missionary in West Virginia. Don was a good student in the local Vernal schools. After graduation from high school, he attended Brigham Young University in Provo. In 1924 Don married Grace Pickup. She had been born on July 21, 1903. Her parents were Clarence Ray Pickup and Vilate Celestia Batty Pickup. Don received his bachelor degree at BYU in the spring of 1926. At the close of school that year, Don and Grace came to the family home at Maeser to spend the summer. One Saturday in June, they were working together on the Lester Bingham farm bringing in the first hay of the season. Grace was working on the heavily loaded wagon, while Don and Arnold Perry, another employee of Mr. Bingham, had just unloaded the first three forks full. 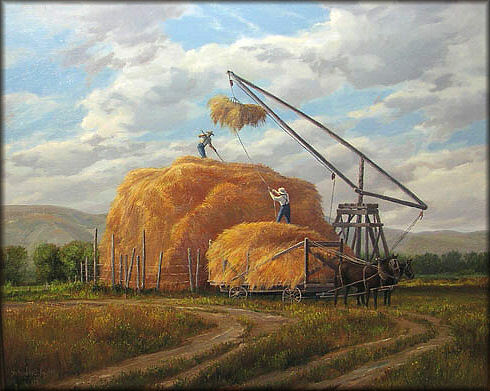 Just as the next fork full of hay was being drawn up from the load, the half-inch chain which held the derrick pole broke, causing the arm of the derrick to fall down endways. It struck Don on the back of his right shoulder and continued on down his side. The pole, which was forty feet in length, six inches through at the small end, and weighed about a thousand pounds, came down with lightning speed. Don McConkie had only time to dodge slightly to one side, which perhaps saved his life. The pole then struck and snapped in two a two-by-twelve-inch timber on the hay rack. Don was immediately rushed to his father's home by Mr. Perry and Mr. Thomas Bingham. They confirmed the obvious -- that medical attention was necessary. He was brought at once into town where an x-ray was taken, showing the extent of his serious condition. He had suffered eight broken ribs on his right side, one broken rib on the left, a broken right leg, and a very badly bruised right shoulder. The day before the accident, Mr. Bingham and Mr. Perry had thoroughly examined the hay derrick and chain to see that everything would be in perfect working order for the haying season. It was supposed that there must have been a weak link in the chain, but the men in overhauling the derrick had been unable to find it. Don convalesced at his parents' home, where he was cared for by his wife and mother. In September of 1926, the State Board of Education issued fifty-seven professional high school certificates, to be valid for five years through June 30, 1931. Among the recipients was Don Leo McConkie of Vernal. In time, he recovered and entered into his first years as a schoolteacher. 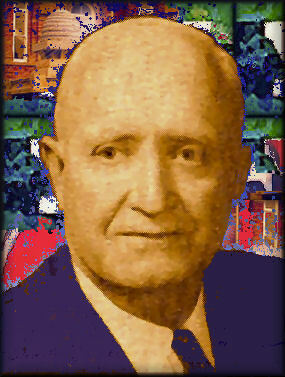 Don taught in the Vernal schools from 1928 to 1941. In 1934, when he was serving as principal of the Uintah High School's Junior High, he received a life high school certificate. He served as a principal several times. In 1941-42 Don returned to BYU, where he earned a masters degree in education. The McConkie family moved to Provo, where Don taught social science at Provo's Dixon Junior High School for 11 years. For two years he was president of the Social Science Department of Utah Education Association. He served as president of both the Uinta and Provo teacher's associations. Don and Grace McConkie had two children: Don Clayton McConkie was known as Clayton, and he graduated from Brigham Young High School in the Class of 1947; and Colleen McConkie, who married David Wayne Beesley. 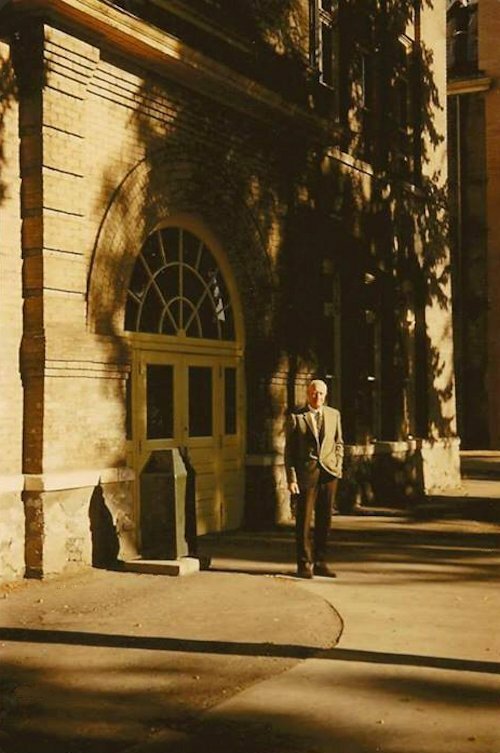 Beginning in 1954 and continuing through 1968, Don was employed as Social Studies & History master teacher at BYH. He served as Sixteenth BYH Principal in 1956-57 school year. He quickly returned to the classroom -- his first choice -- in 1957-58. He taught Problems of Democracy, Student Government, 9th Grade Core, and Social Studies. He was the head of the BYH History Department. When Brigham Young High School was closed in 1968, Don retired at the age of 65. His wife, Grace, lived until April 26, 1993. Don L. McConkie died on December 23, 1994 in Provo, Utah.